Merely applying a product, and therefore an ingredient, to the skin does not ensure it will work for the intended benefit you are expecting. This article will discuss whether, under certain circumstances, it is more appropriate to simply apply a product to the skin vs. activate the skin. First, we will quickly review skin anatomy. No yawning! The cuticle, also known as the stratum corneum, is the outermost layer that functions as a barrier. It can regulate the way products and ingredients enter the skin and the way skin retains its moisture and other nutrients. Beneath the cuticle is the epidermis. It contains living skin cells, which are created by the basal or innermost layer of the epidermis. Under the epidermis is the dermis, which is where collagen and elastin, among other things, are made—which we all know provide the structural support and elastic nature of skin. Even deeper is the hypodermis, also known as the fat layer, which is important for maintaining facial skin volume. One the primary functions of skin is protection. The skin’s carefully constructed barrier is composed of lipids and skin cells called corneocytes. If the barrier is working properly, select active ingredients can cross the barrier while toxins are repelled. The barrier is also the gateway to the other skin layers. Now that we’ve reviewed the skin structure, let’s discuss whether products should be applied to skin, or applied to activate skin. In the following discussions, the "target" is the layer of skin impacted to generate the desired response. Skin exfoliation is generally for one purpose—to improve skin tone and texture though the removal of superficial dead skin cells. In this case, you can apply enzymes, acids or solvents to remove these layers. This is a great example of where it’s more appropriate to apply products and ingredients as opposed to activating skin. Note that due to the barrier function of the skin to prevent external materials from entering, ingredients like collagen, elastin and high molecular weight hyaluronic acid will not pass through the barrier. They therefore will not reach the epidermis, dermis or fat layer, and are only effective as surface moisturizers. The epidermal tissue contains living skin cells whose structures include a viable nucleus. These cells are continuously active, producing and consuming a variety of different biochemicals throughout their lifetime. 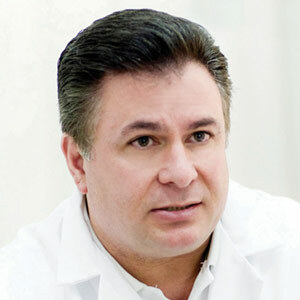 Epidermal stem cells located at the basal layer of the epidermis are important to skin cell renewal. Melanocytes (pigment-producing cells) also are found at the basal layer. The important thing to remember here is, if you want to affect or activate the epidermis, you need a product that can pass through the skin barrier and reach as deeply as the basal layer; otherwise the product will not work. For instance, if you have a skin lightening product containing ingredients that act on melanocytes, these ingredients need to get to the melanocytes in the deep basal layer to have any effect. Also, we’ve all heard of growth factors, which can be any number of specific molecules including epidermal growth factor (EGF) or the nerve growth factor referred to as VGF. These growth factors are incorporated into formulas at low levels, since they can have significant activities in skin. But again, they are only effective if they can get into the epidermal tissue, particularly the basal layer, which is made even more difficult by their presence at low doses. Activate: Serums, peels and light or heat services. The dermis contains an important structural cell called a fibroblast. It acts as a factory, taking orders from the outside and making different products based on those orders. For instance, if the skin needs more elastin for sagging, collagen to repair wrinkles, or lipids to optimize barrier function, the skin sends an order to the fibroblast to make each of these products. In biochemistry terms, these orders are sent to the skin factories (fibroblasts) through compounds called peptides. However, the production of peptides slows dramatically as we age, so the orders to the factories slow, in turn slowing the factory production of these essential skin-firming and tightening compounds. What can we do about it? Apply serums containing peptides, bio-peptides and a range of other actives to re-activate the dermis. But does this work? The answer is maybe depending on the bioavailability of the activator—that is, whether it enters the body at levels where it can have biological effects. If the active can penetrate to the dermal tissue to interact with the fibroblast, it is bioavailable and can work. If the active ingredient is: too large to penetrate the stratum corneum, not soluble enough to penetrate, too low a dose to work, or the wrong type of activator, it is not bioavailable and will not behave as an activator. Many practitioners think the skin’s fat layer is not active,but it is. 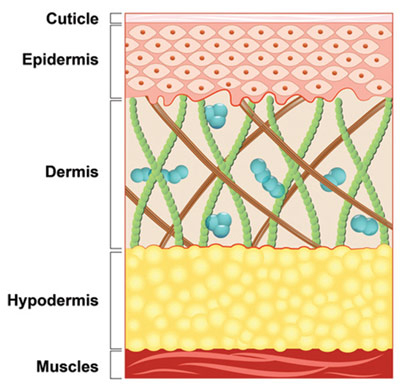 While difficult to reach with skin care products, the hypodermis layer serves a critical function in medical esthetics. It supports underlying tissues and provides the proper three-dimensional volume. This is why the market is full of products containing hyaluronic acid ingredients. When formulated properly, they can provide added volume to aging skin, thereby imparting a more youthful look. 1. The described skin targets are at different depths, so acting on them provides different effects. 2. If the ingredient matches the target level, it will be effective. If not, it can be too effective or not at all. For example, if an exfoliator penetrates too deep, it may irritate the skin. If a peptide sits on the surface, it cannot activate fibroblasts and will not work; or if a skin lightener only penetrates to the upper epidermis, it also will not work. 3. If the skin is occluded, meaning it has a film or coating on it, products cannot provide activity or apply effectively. Note that such occlusion can come from cleansers. 4. 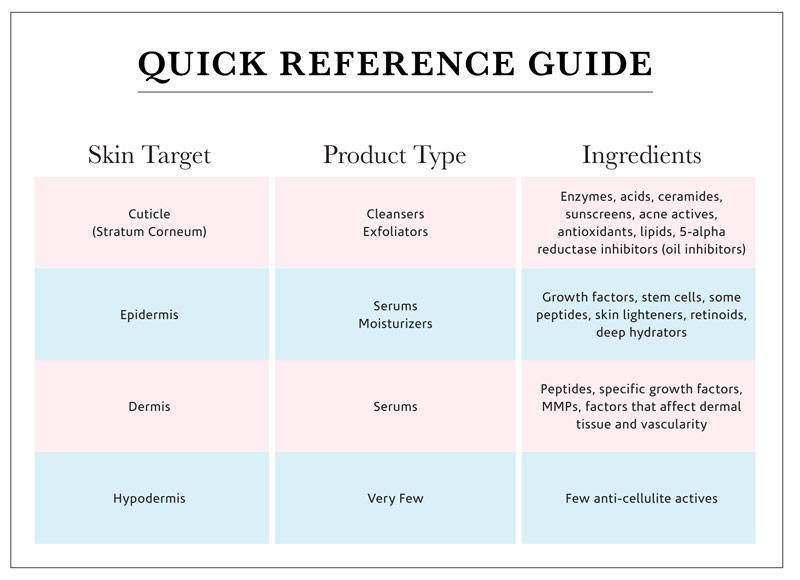 Finally, know how to read an ingredient list and match the ingredients to the skin type and need you are treating.